Whether you're planning a small get-together with friends or a big, fancy bash, appetizers are the key to any good party. Aside from these recipes, you might consider making mini, open-faced Reubens using cocktail rye bread, corned beef, Thousand Island dressing, kraut, and Swiss cheese. Whole water chestnuts, wrapped in a short bacon strip and skewered with a toothpick, then baked until the bacon is done are amazingly good. And mixed, spiced nuts are always popular for munching. Oysters have long been considered an aphrodisiac, so what better to serve as a simple and playful appetizer for a romantic meal for two? 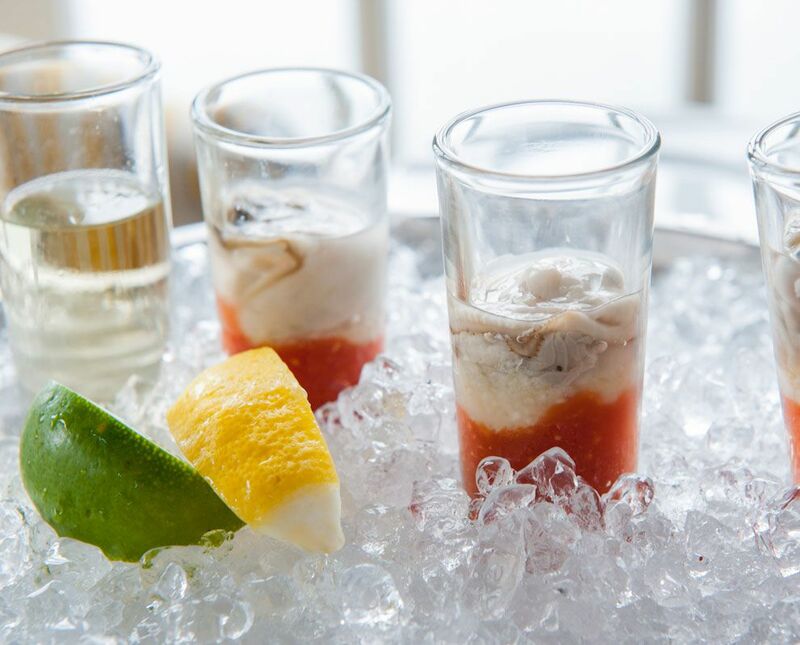 These oyster shooters should be made just before serving - or better yet, make an activity of it and make them together! These smoked salmon bruschetta can be prepped hours in advance and refrigerated, but are quick enough to make and serve in 15 minutes. The smoked salmon brings rich deep flavor, which the brie lightens up making it suitable for an appetizer. Dill and red onion are optional but lend a remembrance of lox. Saganaki sounds Japanese but is actually a Greek cheese dredged in flour, fried in olive oil and drizzled with lemon juice. It's a great appetizer to serve at cocktail parties, and it sure to be a surprise hit. Deviled eggs are a popular component of cookouts and picnics - not to mention being a great snack at any time of year. They can be made a day or two in advance, are perfect for eating with your fingers, and are almost universally loved. Tuna deviled eggs is a little unusual, but give it a chance. It's delicious. Hummus bi Tahini (Chickpeas with Sesame Paste) is wildly popular throughout the Middle East and Northern Africa. It is a great option as a vegetarian appetizer and is versatile enough to allow experimentation with different flavors. Serve it with warm pita, crudites or crackers. This recipe for parmesan crisps couldn't be any simpler. And because it's so simple, the quality of the ingredients is essential: use genuine well-aged Parmigiano Reggiano and shred it yourself. Rosemary should be freshly chopped, and the pepper freshly ground. These fried chickpeas (ceci fritos) are best straight out of the skillet, but they also keep for up to three days in an air-tight container. And they're much healthier than potato chips or cheese crackers as a mid-day snack. Gougeres are bite-size savory puff pastries generally made with cheese. Best of all, these can be frozen and reheated. The prosciutto makes it into a kind of French ham-and-cheese. There is a controversy about who actually invented these appetizers, but Buffalo chicken wings have become a staple pub food and pre-meal snack. This is the original Anchor Bar recipe (reportedly the place where the recipe was invented in 1964). Use pecans, peanuts, cashews, or a mixture in this spiced nuts recipe for a crunchy, salty treat.